Eastern Massachusetts has been getting a serious dose of rain. On July 12, Hanscom Air Force Base in Bedford, recorded about an inch of rain in a mere 7 minutes, and 2.44″ in 35 minutes. The average total precipitation for July is usually around 2.5 inches. For Bedford, the 200-year storm is 2.33 inches in 30 minutes. (A 200-year storm is a storm so big it only has a 0.5% chance of occurring in a given year.) But, we may see more of them in the future. Very heavy precipitation events like this are becoming more severe and more frequent, especially in the Northeast. 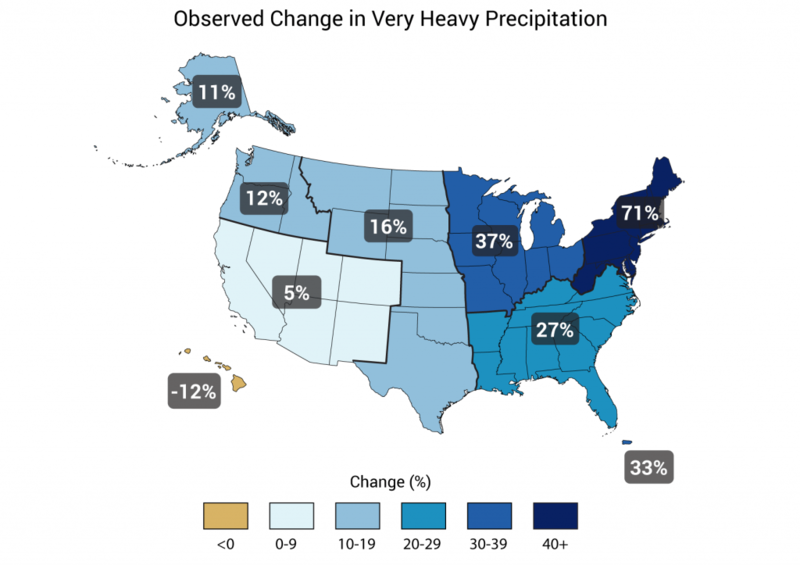 From 1958 through 2012, the amount of precipitation falling in the heaviest 1% of precipitation events increased by 71% in the Northeast. It may be counter intuitive, but as our climate becomes warmer, we face a greater risk from stronger storms. With more heat, we have more evaporation and more energy to carry the moisture aloft where it can power big thunderstorms. So, it’s not our imagination. We are seeing more heavy downpours than in the past, and that trend is likely to continue into the future. That could have serious implications for how we prepare for storms. The infrastructure we have in place to deal with all that stormwater is based on the general idea that the sizes of storms we see over time doesn’t change. Climate change has blown up that idea. We may see 200-year storms roll around every 50 years or so, and our infrastructure will need to handle multiple storms larger than it’s currently designed to manage. But simply replacing infrastructure with newer versions designed for larger storms may also become obsolete in the future as the climate continues to change. We need to prepare for things to keep changing. We need to be dynamic and adaptable. That’s a difficult challenge to solve, but one the best ways to make the landscape as resilient and flexible as possible is to preserve open space and let nature take care of itself. Low-impact Development (LID) is one green infrastructure approach to do just do that. Green infrastructure can also help deal with droughts like the one we went through last year. Natural spaces not only soak up excess water, but also allow water to makes its way back into the ground. That keeps streams and waterways in a healthy balance for both habitat and drinking water supplies. This entry was posted in Climate on July 13, 2017 by Daniel Brown. Many that work on climate change issues, including myself, are finding themselves bizarrely optimistic after President Trump withdrew the U.S. from the Paris Climate Agreement. Just to be clear, it’s a terrible decision. There’s no practical benefit. It will cost the U.S. jobs in the renewable energy sector, and it sends a horrible message to the world that the U.S. doesn’t care about responsibly managing our planet for future generations. But that being said, the overwhelming, unified backlash has been incredibly encouraging. Representatives from both major political parties, including Governor Baker, have voiced support for the Paris Agreement, and every commercial sector you can think of, from oil companies to investment banks to coffee shops, is opting to follow the accord of their own initiative. The very day that Trump made his announcement, 12 states and Puerto Rico began joining the United States Climate Alliance, a group of states and territories vowing to uphold the Paris Agreement. Proudly, Massachusetts became a member of the Alliance after Governor Baker saw an undeniable surge of public interest. (Thanks to all who called his office!) Ten additional states and D.C. have pledged follow the Paris Agreement without formally joining the Alliance, and more than 300 U.S. cities representing more than 61 million Americans will honor the accord. In parallel, the “We Are Still In” (#WeAreStillin) coalition of government officials, mayors, investors, universities, represents 120 million Americans and $6.2 trillion of the U.S. economy, all pledging to follow the agreement. In some critical ways, this local, state, and public phalanx of support for the Paris Agreement is a far stronger, bolder step toward progress than what any U.S. President could recommend. We are witnessing an inspiring movement of local and state officials taking ownership of their own jurisdictions’ carbon emissions. These are people that have real agency to reduce emissions expeditiously for an enormous percentage of the U.S. population, and they have actively decided to make a difference. They’ll protect the planet of their own will, rather than let a president tell them to. What’s more, people from all walks of life are discussing what we should do about climate change and why reducing emissions is so important to limit future warming. The science is clear and more people are now paying attention to the consequences of burning fossil fuels. It is often said that climate change is a global problem with local solutions. That’s true, and President Trump’s move to surrender U.S. leadership has put the rest of us in the driver’s seat. We have the power to reduce our carbon emissions as individuals, as communities, as states, and as people on one planet. It’s up to us now. It’s more important than ever to protect nature for people and wildlife in face of climate change. There a few things we can do as individuals and active citizens that really make a difference and honor the spirit of the Paris Agreement. As individuals, we can Make the Switch and choose to get our electricity from renewable sources. As citizens we can tell our community leaders to get energy from sustainable sources at the municipal scale. 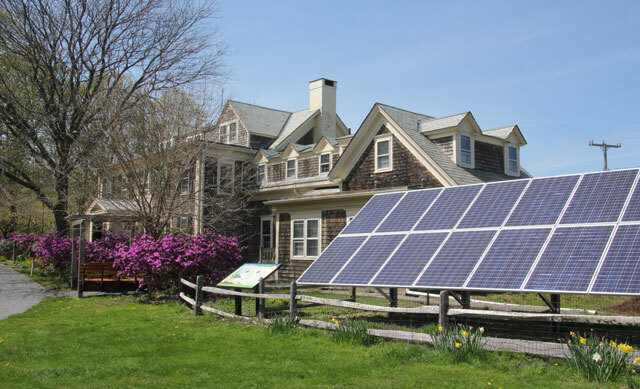 The town of Arlington recently became a leader as other towns can, by taking advantage of Community Choice Aggregation (CCA). Essentially, CCA is a way for communities to source their own energy and lower electric bills at the same time. There are many options for keeping carbon out of the atmosphere and keeping the places we live healthy. Talk to your own community leaders and see how you can help make your community a green community! This entry was posted in Climate and tagged climate change, paris agreement on July 6, 2017 by Daniel Brown. Four short films will be followed by conversation with the Lexington stars of “Save Tomorrow”. Admission is free and open to the public. This entry was posted in Climate, Get Involved, Special Events on April 27, 2017 by Daniel Brown. If you’re looking to avoid freeze damage in your garden, the recommendations for what you should plant have changed over the last 25 years. Plant hardiness zones are recommendations for planting based on the risk of extreme cold in a given region. Some plants and trees are more resilient to cold snaps than others, and different plant types are categorized by different zones. Warmer zones, for plants less hardy to deep freezes, are typically found farther south, as you’d expect. Zones prone to harsh cold snaps are typically found farther north. As USDA and Arbor Day Foundation revisited the data over time, they found the risk of extreme cold snaps had lessened across much of the country. From 1990 through 2015, as you can see in the following images, the recommended zones shifted noticeably northward. That means planting recommendations have changed. Plant types best suited for areas farther south in the past may now be viable farther north. Plant Hardiness Zones, 1990 and 2015. Images from USDA and Arbor Day Foundation. 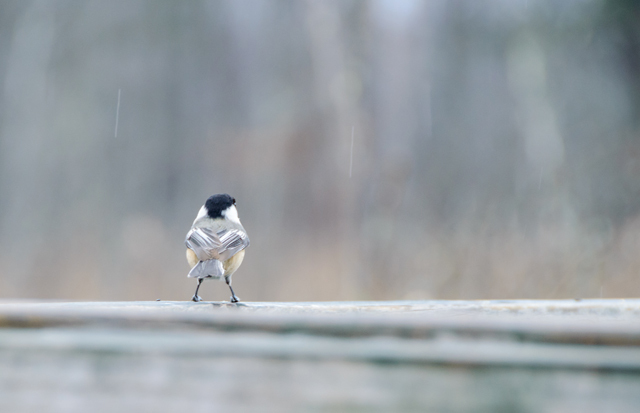 At Drumlin Farm Wildlife Sanctuary in Lincoln, our staff had some fun with this last season. They were able to grow cotton and peanuts, crops typically found much farther south. Others pointed out that they’ve been planting their own gardens earlier and earlier over the years. Many noted that they start their tomatoes 2 weeks earlier than they once did. Is the shift in plant hardiness zones evidence of climate change? Probably. It fits with other temperature trends we’re seeing. Our growing season is longer than it used to be. Our winters are shorter. Overnight low temperatures have warmed. It’s also consistent with what climate models tell us will happen. Warming temperatures tilt the scales away from extreme cold snaps and toward record heat waves, even though those cold snaps still occur. Of course, we should temper our expectations. This is just one piece of evidence among many other pieces of evidence. The Northeast still faces the risk deep freeze in the late winter and early spring. The risk is just less than it used to be. It’s entirely possible next year could be brutally cold even as our climate warms, and local factors are still critical. As always, consider plant hardiness zones a guide, another small piece of advice when making decisions about the unique circumstances of your own growing. 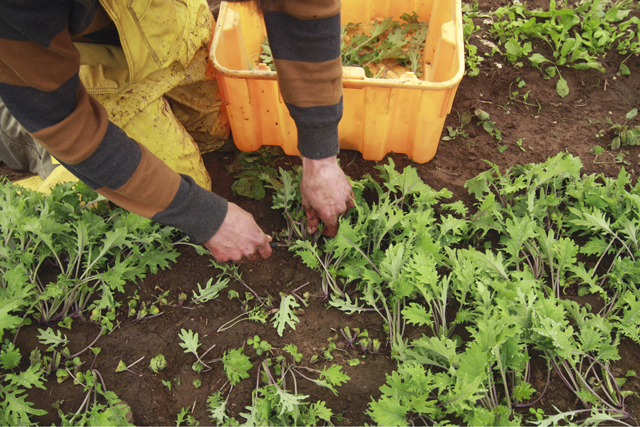 Over time, changing zones can help us think about what we might grow instead of what we’ve been growing. They may also help us adjust the timing of our planting to suit a changing growing season. You can learn more about plant hardiness zones here and here. This entry was posted in Climate, Gardening and tagged climate change on April 11, 2017 by Daniel Brown.